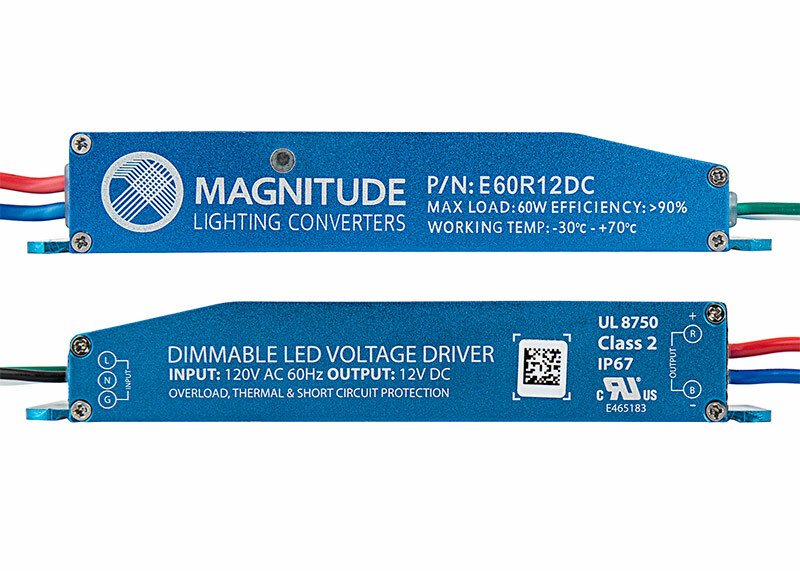 The Magnitude super-compact dimmable LED driver with built-in junction box is class-2 rated and has a maximum load of 60 watts. The 12-volt driver is encased in a low-profile aluminum enclosure to enable easy installation for cabinet lighting, under-cabinet lighting, cove lighting, bookshelf lighting, showcase lighting, cupboard lighting, or for other applications where space is limited. Features auto reset, over-current, and short-circuit protection. Efficiency of 90% and above allows the driver to operate at low temperatures. Compatible with TRIAC dimmers. Underwriters Laboratories (UL) LLC is an independent testing agency that works to verify product safety and quality. A UL-Recognized label ensures that a product component, such as a power supply or LED light strip, has been tested and verified as safe to use in a UL-Listed product. UL-Listed product samples are tested by UL and meet their Standards for Safety requirements. TRIAC Dimming: Triode for alternating current (TRIAC) dimming is used to control high-voltage dimmable power supplies such as Magnitude Dimmable Power Supplies. 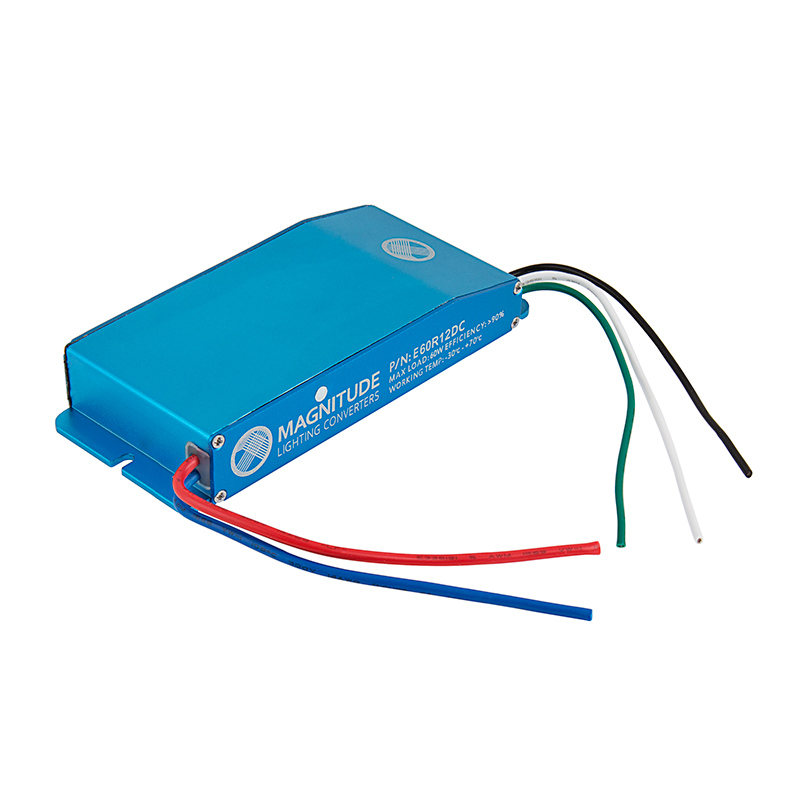 These dimmable power supplies work by varying the power on the AC input side of the power supply by means of a TRIAC dimmer. This change in power on the AC input side will vary the voltage on the DC output side and control the intensity of the LEDs. TRIAC dimmers are common hardware store and household dimmers, which include brand names such as Lutron and Leviton. Pulse-Width Modulation Dimming: Pulse-width modulation (PWM) dimming can be used to control dimmable power supplies such as Mean Well HLG Series and Mean Well LPF Series. This type of dimming control adjusts the output current based on the duty cycle. As the duty cycle increases, current will increase and the LEDs will be brighter. Conversely, if the duty cycle decreases, the current will decrease and the LEDs will be dimmer. Pulse-width modulation for these drivers is based on a 10V signal level with a frequency between 100Hz~3KHz. 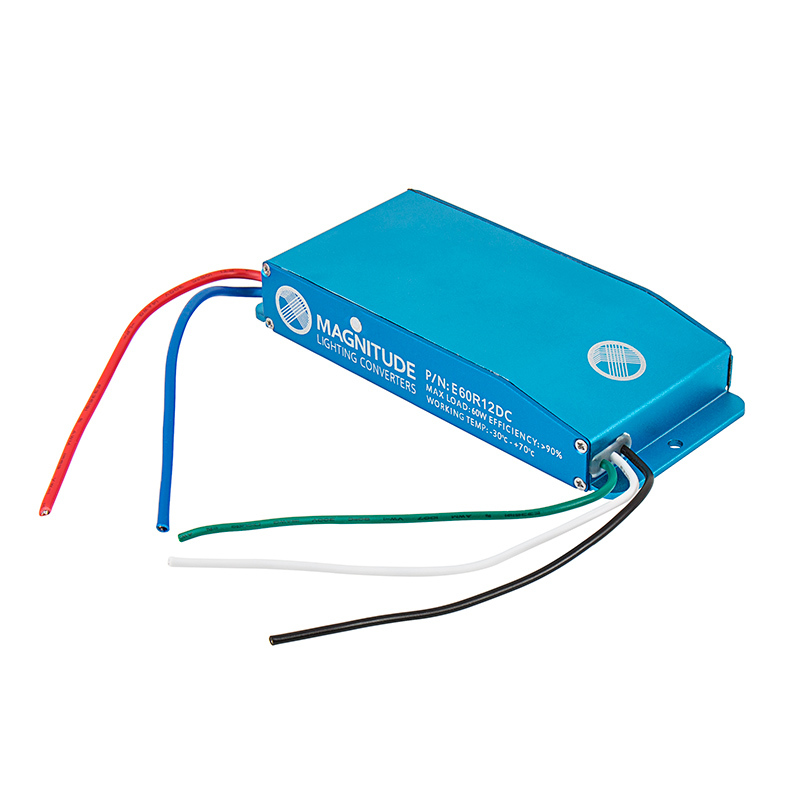 The MCBRF-4A or MLD-5A are compatible for this application. Resistive Dimming: Resistive dimming can be used to control dimmable power supplies such as Mean Well HLG Series. The resistance can be fixed or variable. If a fixed level of dimming is required, a simple resistor is all that is needed to dim the LEDs to a particular level. 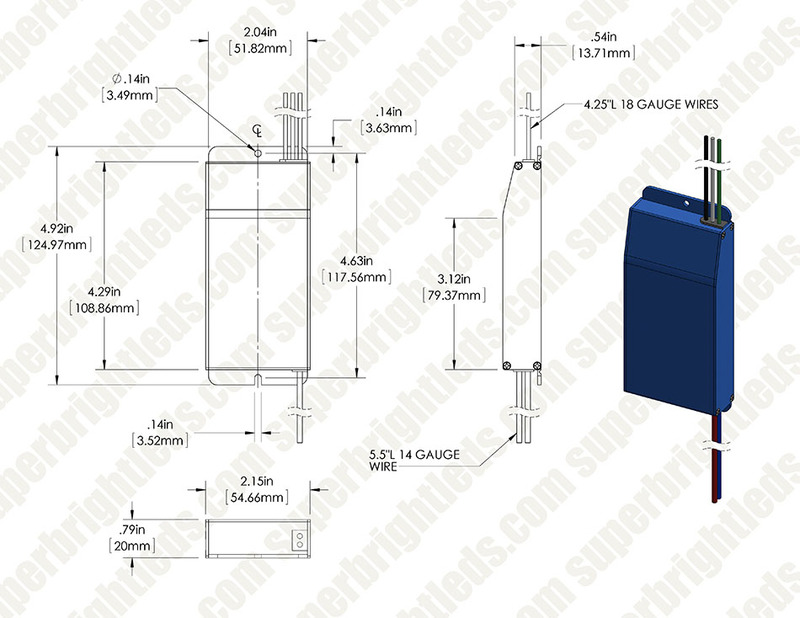 If a varying dimmable level is desired, a potentiometer can serve this purpose. By changing the resistance value of the potentiometer, the output current of the power supply changes, and the LED intensity changes. Controlling a single power supply will require a 100K ohm potentiometer for 100% intensity (100K ohm) to approximately 10% intensity (10K ohm) based on where the wiper is positioned. 1-10V Dimming: 1-10V dimming can be used to control dimmable power supplies such as 12V Mean Well HLG-40~240 Series or 24V Mean Well HLG-40~240 Series. This type of dimming control is an older style for compatible dimmable power supplies and is being replaced with 0-10V dimmer control. 1-10V dimming control works by varying the voltage from 1-10 VDC. A 10-volt signal on the dimming wire will allow for maximum current to flow to the LEDs for maximum intensity. A 1-volt signal on the dimming wire allows 10% of the current to flow from the power supply, which generates approximately 10% of the maximum intensity for the LEDs. 0-10V Dimming: 0-10V dimming can be used to control dimmable power supplies such as 12V Mean Well HLG-600 Series or 24V Mean Well HLG-600 Series. This type of dimming control is the most popular and newest style for compatible dimmable power supplies. 0-10V dimming control works by varying the voltage from 0-10 VDC. A 10-volt signal on the dimming wire will allow for maximum current to flow to the LEDs for maximum intensity. A 0.6-volt signal on the dimming wires allows 6% of the current to flow from the power supply—dimming the LEDs to approximately 6% of full intensity. 0-10V dimmers can be found here. In the past, constant-current LED power sources were referred to as LED drivers, and constant voltage LED power sources were called LED power supplies. Today, the terms are interchangeable.